I just arrived to Singapore on Finnair’s special Angry Birds flight from Helsinki. 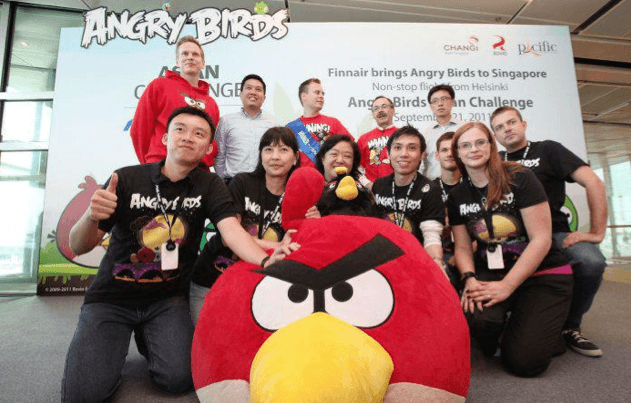 The first ever Angry Birds Asian Challenge took place on this fun flight that seemed to go much faster than the 11,5 hours than what it did in reality. The Asian Challenge winner Jani Uljas from a Finnish travel website Rantapallo.fi was crowned at the Changi Airport immediately after the flight. The plane was decorated in the Angry Birds theme, every passenger was able to get their own Angry Birds plush toy and Helsinki airport had special musical performance (Angry Birds theme music of course played by a live band) and special Angry Birds menu at the Finnair lounge prior the flight. These are just a few of the fun details of the first ever Angry Birds flight. More details and pictures coming after I have toured a few days in Singapore and get back to my home office. Until then… See more in this video created by Changi Airport in Singapore today.